We’re back! With Season 05 of the Total Divas Recap. So let’s get started, shall we? Total Divas picks up where it left off last season. Dolph Ziggler and Nikki Bella go out by the production trucks to talk while John Cena faces Stardust in a US Open challenge. Dolph is telling Nikki that he is able to give her everything she’s ever wanted, like a husband and children. She doesn’t have to settle for Cena who doesn’t want to get married. Nikki thinks this is really disrespectful to Cena who is not only in the building but also the man that Nikki wants to be with. Ziggler makes a move anyway; Nikki but she slaps him! #TotalDivas 4 month cliffhanger all for a slap to Ziggler. Somewhat worth it. She leaves to tell Brie, who had a suspicion that Dolph still had feelings for Nikki. Dolph follows Nikki and wants to explain his actions. Nikki shuts Dolph down again and then joins her sister. The Bella Twins run into Paige and tell her what happened. Paige agrees that Nikki did the right thing save the slap: she would’ve headbutted Ziggler. Paige thinks that Nikki should tell John as soon as possible. They all agree not to tell Nattie because she’ll tell everybody. But… the Divas are headed to Japan (at least Nikki, Tamina and Paige are)!!! On the tour of Japan, Cena and Ziggler are teaming together. Awkward! Paige still thinks Nikki should tell Cena before Dolph does. "I'm defending my title in Japan, but now I gotta worry about my relationship and my ex" Nikki on how hard #TotalDivas-ing is. Backstage, Nikki runs into Dolph. Dolph asks if Nikki broke the news to Cena. If not he’ll do it. Nikki asks him not to and the entire conversation is uncomfortable. Paige overhears this and decides that she needs to mediate their issues. She goes sight seeing with Nikki and they conveniently end up at a Fish Spa (little fish eat the dead skin off your feet). If you need more reason to love Paige, the fish pedicure on #TotalDivas just showed she's insanely ticklish. Surprise! Dolph Ziggler shows up too because Paige invited him. Paige tries to help Nikki and Dolph hash out their issues but all Dolph does is point out how Nikki sounds like an 18-year-old girl for calling Cena her “soulmate.” Dolph also points out that Nikki’s ideal man (Cena) sounds like a 13 year old’s Instagram account: he lifts heavy things, says inspirational quotes and runs awkwardly to the ring. After her match at Beast in the East, Nikki watches the Cena / Ziggler tag match. It makes her uncomfortable. Nikki and Cena have plans to go to dinner and Nikki promises to tell John everything there. Nikki tells Cena everything that’s been going on: Dolph pulled Nikki aside and told her that he wanted to give Nikki marriage and babies. Dolph tried to kiss her. She slapped Dolph. "It's about to get interesting." It better, Cena. #TotalDivas has been teasing this for MONTHS! Hahah I love John Cena. "Dolph tried to kiss me." "That's cool." #TotalDivas Cena's so nonchalant about Ziggler flying under the radar to Nikki, because he's probably about to get his grub on. He loves Nikki and treats her like a grown woman. If there’s something between Dolph and Nikki, he’s not going to stop Nikki. He couldn’t if he wanted to. John Cena handled this Dolph Ziggler thing in the most John Cena way possible, by shrugging it off because hey he's John Cena. 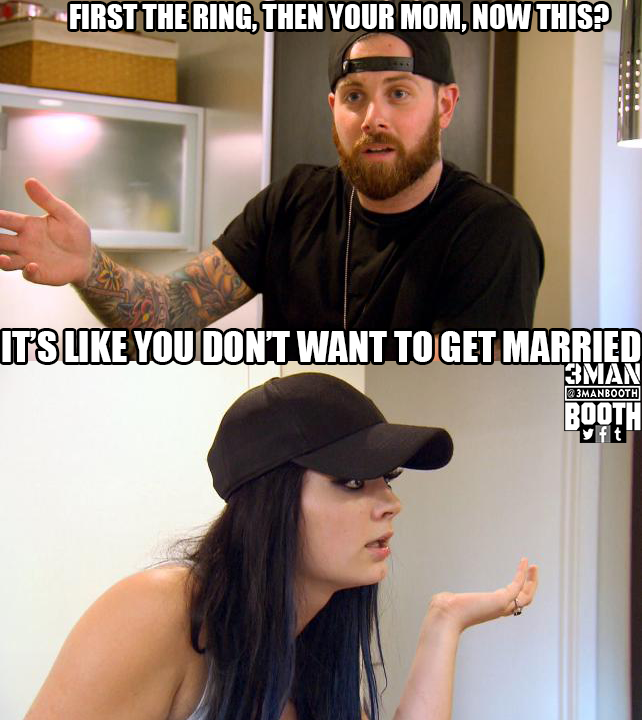 Paige has yet to tell Kevin that she doesn’t want to be engaged to him, even though she wants to be with him. She’ll tell him when she gets back from Japan. But while in Japan, she find out that Kevin’s parents are coming to visit them in Florida, presumably engagement-related. But that’s an America problem. In Japan, Paige visits a cat café and Facetimes with Alicia Fox from the “Kitty Kingdom” to share the experience. In the process, she updates Foxy on the Kevin situation; Fox tells Paige to tell him. Post-Beast on the East, Paige returns to America where Kevin picks her up from the airport. Paige is telling Kevin about her time in Japan but Kevin wants to talk about wedding planning. Kevin notices that Paige isn’t wearing her wedding ring. Uh-oh! Paige took the ring off because … she didn’t want to lose it. Yeah, that sounds like the truth. She can’t wear the ring while wrestling so she point it in her bag for safe keeping. Now Paige is really nervous as to how Kevin will react when she tells him that she doesn’t want to wear the ring at all. Back home, Paige gets a call from her Mom, who just learned via television that her daughter is engaged. Saraya is pissed and has a bunch of questions about the engagement. Paige, flustered, hangs up the phone abruptly and right into an argument with Kevin. These are the wedding details that he and Paige need to discuss before his parent get here: how many people will be at the wedding, what will the venue be, etc. Paige doesn’t care about these things because she doesn’t care about being the bride. Kevin doesn’t want to plan it all by himself when Paige drops the bombshell: she doesn’t want to be engaged! Paige clarifies. She doesn’t want to lose Kevin but she doesn’t want to be engaged. She liked everything the way it was. She tried to give Kevin hints that she didn’t want to get married but Kevin missed the signs. Paige wants to be in this relationship and didn’t want to lose him. Paige: I would give you hints that I don't want to get married. Kevin says that she’s never going to lose him ever. Now Kevin and Paige can figure out the next step in their relationship, as long as that step isn’t marriage. Brie Bella is focused on helping Daniel Bryan find the next thing in his life. Daniel Bryan is focused on getting back into the wrestling ring. On season 5 of #TotalDivas, Brie tells Bryan to get a job. Daniel is a judge on Tough Enough but Daniel says it’s not his thing. Brie thinks that Daniel has options. Daniel thinks that once he stops wrestling, people will stop paying attention to him. Brie brings Daniel to her project: Experience Local. Brie thinks that Daniel could use his newfound free time to work on this since local products is something they have in common. Brie mentions that Daniel made a ton of jam from some watermelons from their garden. Daniel mentions that even when he’s gardening, he’s thinking about wrestling. Still, he agrees to get an email address and help with Brie’s project. In the car, Brie talks to Daniel Bryan about Experience Local. Brie is excited buy Daniel is clearly not. Daniel points out that Brie will be on the road a lot and his passion isn’t selling people stuff. Brie just wants Daniel Bryan to wake up in the morning and look forward to something. Brie on #TotalDivas: At some point, you're going to have to find something else in your life to do. At Brie and Daniel’s house, Brie mentions that she’s behind on some of the Experience Local work and asks Daniel to pitch in. Daniel is reluctant to take on these responsibilities. Brie is focused on helping Daniel move on from wrestling but hasn’t realized that Daniel Bryan isn’t ready to leave wrestling. Daniel’s asking Brie not to push him; otherwise he’ll push back emotionally. Brie agrees to emotionally support him instead. And, playfully, Bryan puts Brie in an armbar. YOU STILL GOT IT! 3 seconds of wrestling from Daniel Bryan on #TotalDivas shows that he should be cleared. Nattie is worried about Tyson Kidd. Tyson needs to have a very scary complicated surgery after his in-ring injury. At Nattie and Tyson’s place, Nattie’s parents visit; the four of them discuss the potential dangers of the surgery. Total Divas brings up the Divas Revolution, the moment in the WWE where 3 NXT Divas – Becky Lynch, Charlotte and Sasha ‘The Boss’ Banks – were brought up to the main roster to feud with the Bella Twins and Alicia Fox, Paige, Tamina and Naomi. We’ll see this from the Total Divas perspective this season. Along with us on Twitter and here at threemanbooth.com! This entry was posted in Season 05, So That Happened, STH, Total Divas, WWE and tagged Alicia Fox, Beast In The East, Brie Bella, Daniel Bryan, Dolph Ziggler, John Cena, Kevin Skaff, Natalya, Nikki Bella, Paige, So That Happened, STH, The Bella Twins, Total Divas, Tyson Kidd, WWE. Bookmark the permalink.